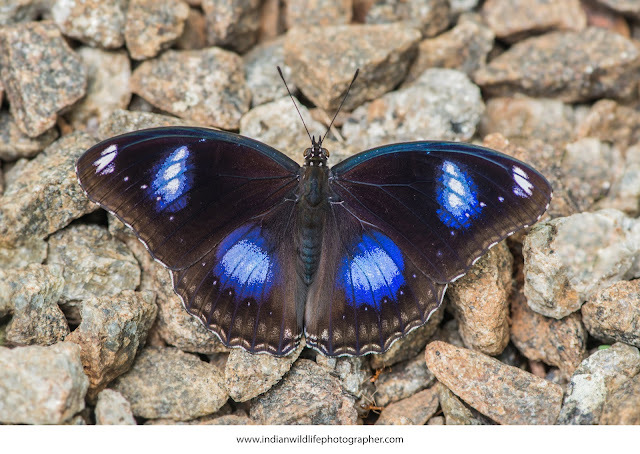 This is common Butterfly in Kerala, Name Great Eggfly (Hypolimnas bolina) or Common Eggfly, also called the Blue Moon Butterfly in New Zealand, is a species of nymphalid butterfly. black-bodied butterfly with a wingspan of about 70–85 millimetres (2.8–3.3 in). The species has a high degree of sexual dimorphism. The female is mimetic with multiplemorphs. The upper side of the wings of the female is a brownish black and does not have any spots like those of the male. The edges bear white markings which are similar to those of theCommon Indian Crow. Madagascar in the west, through to South and Southeast Asia, South Pacific islands (French olynesia, Tonga, Tuvalu, Samoa, Vanuatu), and occurs in parts of Australia, Japan, and New Zealand.